Our last (kinda) full day before heading back </3 I wish I could stay longer but it was just a working weekend after all. I'll miss waking up to this view! Woke up a bit early to be able to get a lot of trips squeezed in before needing to head to the airport for our 9 PM flight. Had breakfast at the buffet of course. I was so sad upon realizing there was actually a waffle and ice cream section that I did not know of until this morning! 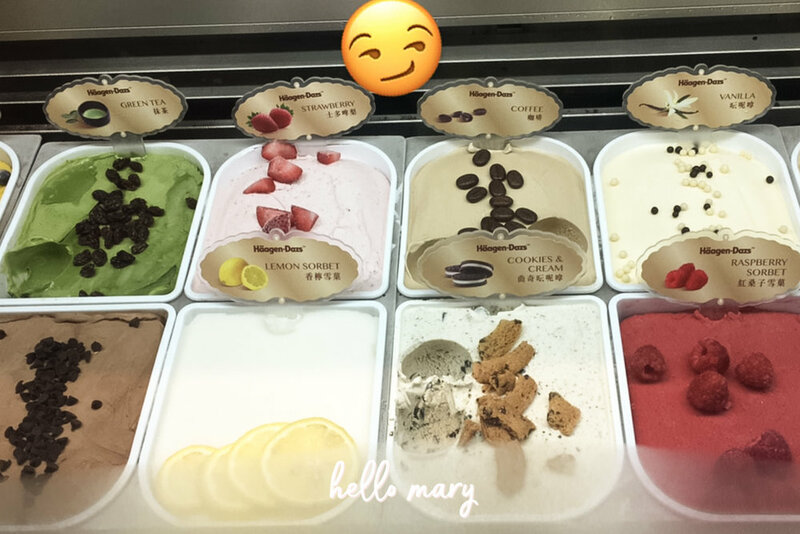 I would have taken advantage of it yesterday -- unlimited Haagen Dasz? Yes, please! After breakfast, we made sure our stuff are all set for our flight in the afternoon so we can just grab everything and leave for the airport when we come back from our last minute activities. 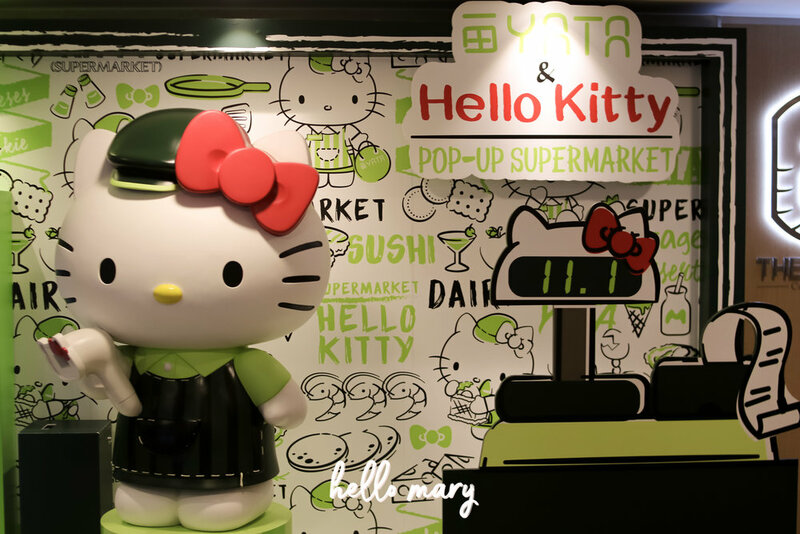 Our first stop of the day: Hello Kitty pop-up supermarket! You could just imagine me shrieking and cooing and being all heart-eyes over everything! Just seeing this made me so happy -- even happier than I first saw the Disneyland sign! HAHAHA. Totoo, ansaya ko sobra. Partly because when this went viral, I never thought I'd be able to come and see it. But the universe made way! 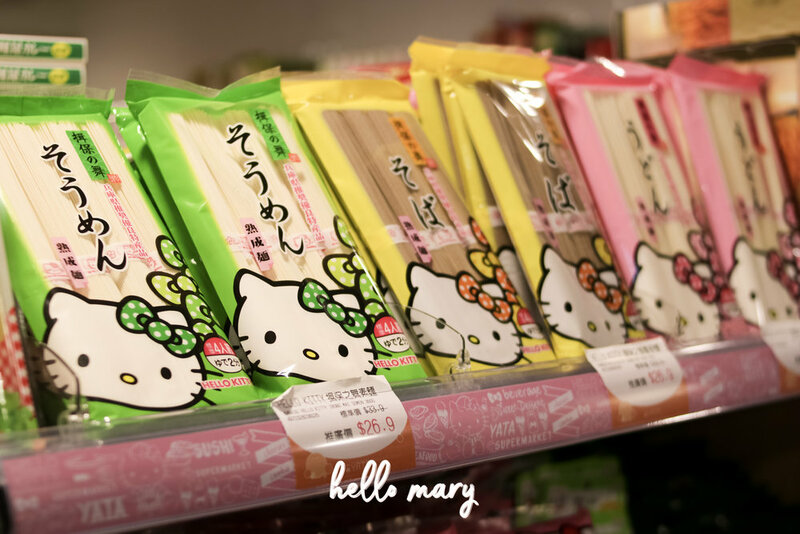 And here are the cutest Hello Kitty Supermarket items that caught my eye! Honestly, once we entered I was teeny bit underwhelmed. I would have thought EVERYTHING, like every. single. item. would be Hello Kitty, but they weren't. They tried though, and that's good enough for a Hello Kitty fan like me. These tumblers and lunch boxes are so cute! But for $200-$400 HKD? No thanks. Kumpleto ko naman na yung Lock and Lock na baunan. HAHAHAHA! I'd get the ones on the left though if I could, I like pieces like that, yung hindi halatang Hello Kitty. More tumblers, chopstick/utensils in a case and some kitchen stuff. How cute are these spatulas? AHHH!!! I went crazy. On to the food! They have a LOT of snacks with Hello Kitty packaging but I only got a pack of these Nori Chips and these strawberry Pocky! Well, it's not the Pocky brand but I don't know what else to call it. Haha. Also, check out the design of the price bar (is that even what it's called?). So cute! This is such a bad photo but HELLO KITTY SHAPED WATER BOTTLES. Whut. I need this on my door, but it's not for sale. Now on to the actual food area! This area kind of blew my mind. Hello Kitty apples??? WHAAAAAT? Yeah, they're just stickers though. Hahaha. The rest of the fruits didn't have any Hello Kitty on them. They had this one section that had all these products with Hello Kitty wearing a bowler hat(?) brand. Spices, soaps, tea, candies -- they even had potpourri. 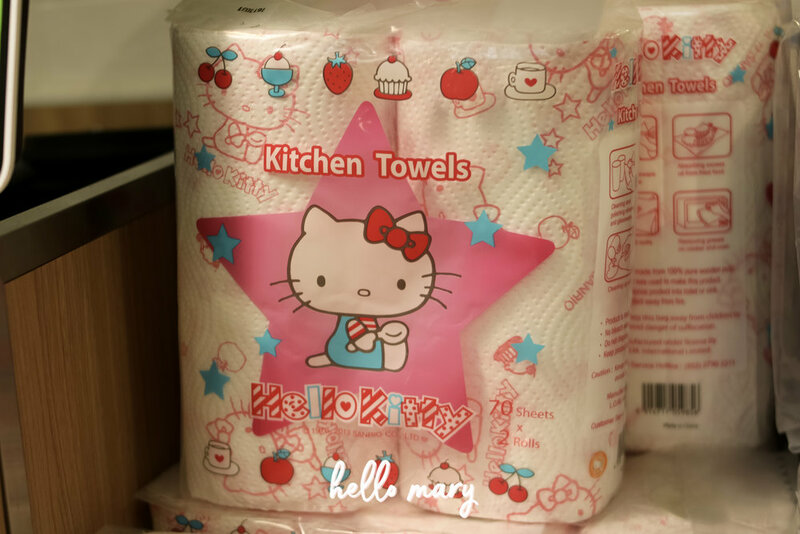 I'm guessing it's the Hello Kitty Green Living brand as it says so on the packages. So cute, but so expensive. 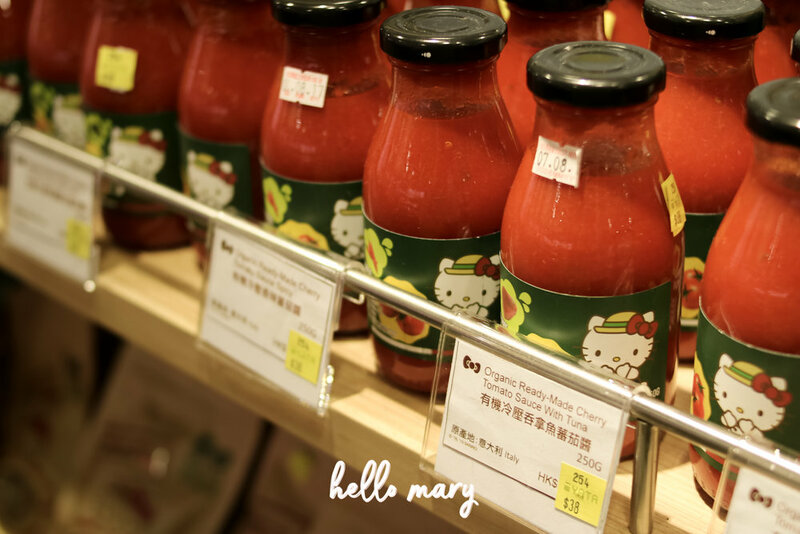 How about this: different kinds/flavors of tomato sauce! Hello Kitty spaghetti and macaroni! The macaroni's so cute but I thought long and hard if I should get it or not. I ended up not getting it. Hahaha! Some more kitchen stuff. Ziplocs and kitchen towels, anyone? I would've gotten these kitchen towels just for the sake of it if only I had space in my luggage. But I didn't, so... next pop-up, maybe? This is what you see by the check out counters. That Hello Kitty cashier is so freaking cute!!! Huhu. Actually, dun ako sa scanner talaga na-aattract. Lels. Look, look, look! Even the receipt had Hello Kitty. Hihi my kitty cat loving heart was so giddy! 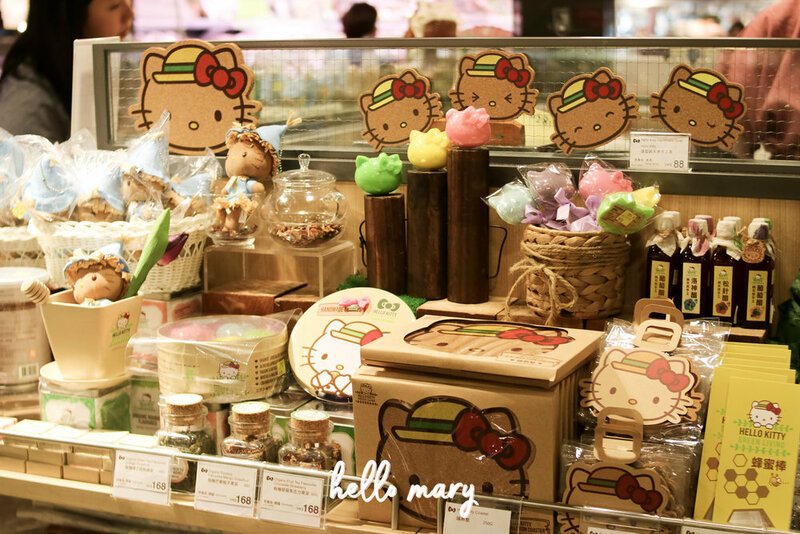 Anywayyyy, after this short but sweet Hello Kitty Pop-up Supermarket trip, si Sir Mico naman namili where we'd go next. He wanted to see art art and buy some antique stuff or whatnot, sooo we went around the Sheung Wan area. 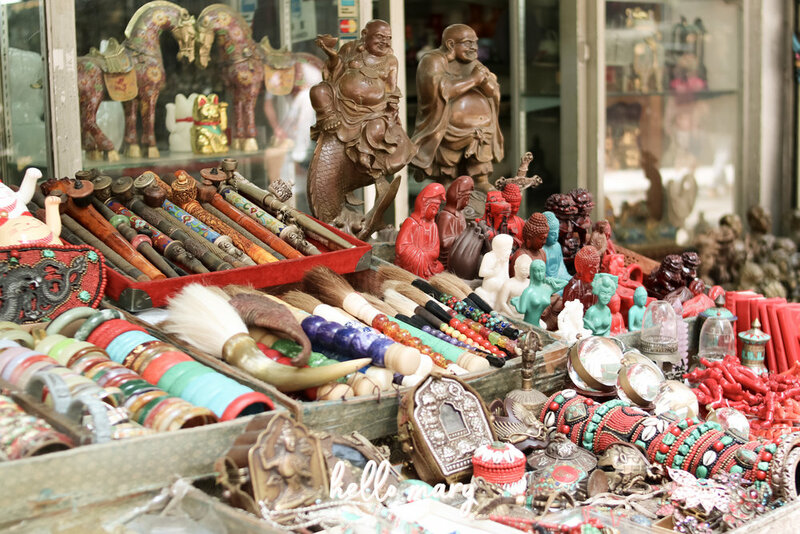 We found some street art, trinkets, cute cafes and a lot more! A real treat for artsy fartsy individuals unlike myself. HAHAHA! I stopped taking photos when we started walking uphill to the other shops. Juskopo. So here's a little story: Sir Mico was looking for a vintage statement piece for his house that would fit in his luggage. He fell in love with this old telephone (bottom right corner). It IS beautiful. He managed to haggle a good price, but the problem? How are we going to bring it home to the Philippines? Ang taas, ang bigat! HAHAHA! Nakakaloka, as in ilang beses namin siya binalikan because he really wanted to buy it. Eventually, he gave up. We're not lugging that thing around ano! Mamaya, masira pa, sayang lang. Hahahaha. Anyway, after that, we decided to go to Causeway Bay (my favorite area!) to shop some more. Went to Times Square. He bought some pasalubongs at Log On, then we tried our luck to have late lunch at Ichiran! Ansaya, kasi wala ngang masyadong pila! We were able to get seats after about 10 minutes of waiting. Yay! Ininggit namin sila Kath & DJ because they wanted to eat here nung first day pa to check if the ramen will taste the same as the one in Japan, but the Ichiran branch near our hotel always had long lines. Hahaha! Also, this is mine and Sir Mico's first time, so mej nangapa-ngapa kami ng very light. But overall, it was such a fun experience and ang sarap nga nung ramen! After late lunch, we went back to the hotel to put down our things. We still had a few hours left so we decided to go around the area and we found this hidden gem in the building right beside the hotel! It's like an outlet shop but everything they sell are signature brands! Chanel, Hermes, Y3, Gucci, etc. etc. Syempre, di ko naman afford pero ansaya lang maki-tingin tingin with those who can. Hahaha! Our ride to the airport. Shala, diba? We had this BUS all to ourselves. Seriously. Hahaha. We only occupied like a third of the seats up front -- and we didn't even sit beside each other. Thankfully, immigration wasn't bad because we left at around 6:30 for an 8pm flight. Emptied out my Octopus card with these treats. Hahaha. Also, my first time to ride from these gates. Ang ganda lang, and there are more shops! Experienced bad turbulence on our way home. So scary. Thank God nothing bad happened to any of us though. Got home safe and sound in the wee hours of Tuesday morning, then back to work for a press conference! Odiba, walang pahinga! Nevertheless super enjoyed this short but fun Hong Kong work trip. 'Til the next one!